I’m always asked this question and so now I’m going to give you all of my ‘dirty’ little secrets to growing the best, most flavorful tomatoes that produce in large quantities! I have been growing tomatoes since I don’t know when. And through the years, I’ve figured out what works and what doesn’t work. I also live in the South (USA), where the soil is mostly red clay. This gardening environment has an incredibly different soil and weather reality than my home state of Iowa where you can grow anything in the rich, dark black soil (Iowa is known as the “bread basket of the nation” for a reason)! I grew up in a family of Italian gardeners and farmers in the Midwest. Everyone in Italy has a garden even if it’s just in a pot on a windowsill! Every inch of the little country of Italy is planted with vegetables and fruit (except in the mountains of rock and stone). When on the Amalfi Coast, I had to take a photo (below) of how the homes are stacked on top of each other hugging the side of the mountain. Gardening in pots on patios gives Italians who live ‘vertically’, opportunities to scratch in the dirt. Both of my grandfathers who immigrated from Italy had gardens that included grape vineyards (of course) from which they made their own wine (and that was some pretty good stuff, I might say so myself)! We always had fresh veggies every spring and summer from their gardens . . . and those tomatoes! 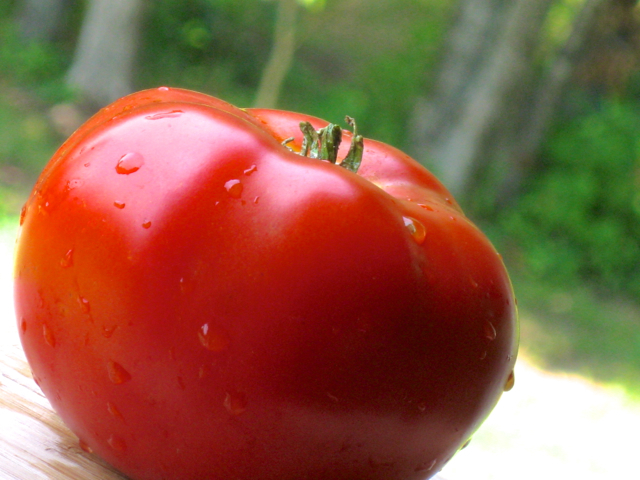 Oh my goodness, nothing could be finer in the summer than home-grown, juicy, red tomatoes! So fast forward to my life and my gardens here in South Carolina with its fairly unforgiving clay soil. What to do? Not to worry, it is possible to overcome adversity in the garden! If I’m facing a challenge, I’m going to figure out how to overcome it . . . including gardening challenges! 1) Pick a SUNNY spot in your garden to plant your tomato plants — they need at least 6 hours of full sunlight. While you’re selecting that perfect spot, don’t forget to plant in a completely different place each year — rotate your veggies so the soil can recover every year. Tomatoes are hungry feeders and really deplete the soil’s nutrients, so you have to move them around your garden each year. 2) Amend that soil!! We have horses on our acreage, so we have a lot of horse poo, if you get my drift! We let the manure age for one year and then blend it into the soil (PS: Rhubarb especially digs poo from horses, cows and other livestock). That ‘crap’ is good stuff, so hang on to it or find a friend who will give it to you. If not, go to your garden center and buy manure, but who wants to pay for ‘sh…t”?. Sorry to be so blunt, but it’s the truth! 3) Get your hands on some BLACK COW in the big yellow bag at your garden center. Buy a LOT of this stuff! It’s full of composte and more goodies that your soil and plants thrive on. Blend it in the soil big time! 4) We LOVE Miracle Grow Garden Soil . . . not potting soil, but gardening soil. It’s full of food for your tomatoes. Blend it in as well. I don’t know if it’s organic enough for some of you, but it works for us and we use bags and bags and BAGS of it! 5) Got any leaves saved over from fall? Chop ’em up and blend ’em in the soil; they are full of nutrients! 6) We composte, that’s right we throw every vegetable and fruit-based ‘garbage’ in a composte pile . . . let it age and blend that stuff in too! 7) Wait for your soil to be WARM to plant your tomatoes. If you’ve got neighbors who are planting early . . . don’t worry, your patience will pay off as your tomatoes will not only grow to the same height and width of your neighbors’ earlier planted tomatoes, they will SURPASS those earlier planted tomatoes with healthier vigor and productivity because you waited for the soil to warm up! 8) Plant on an overcast, cloudy day so as to not shock the plants as much. 8) Dig a deep, deep hole for each tomato plant. 9) Sprinkle in each hole, a handful of crushed egg shells into each deep hole. WHY? The eggshells provide something that tomatoes thrive on and can’t get enough of: CALCIUM! The calcium from the egg shells is absorbed up into the roots and into the stems of the tomato plants. If you have yellowing tomato plants, you have a calcium deficiency! Buy a bunch of eggs, make egg salad sandwiches, top your salads with chopped boiled eggs, and make some delicious deviled eggs! Its’ worth it! NEVER throw away an egg shell if you are a gardener! And when you boil eggs, don’t throw away the water, it’s full of calcium from the egg shells, so let the water cool off and water your tomato plants with it. 11) Sprinkle in some bone meal! 12) Place the tomato plant in and pinch or clip off all of the layers of leaves except for the top one or two layers of leaves. Yup that’s right, bury them deep so that the roots will grow super, super strong! All of those little hairy things growing on the stems will grow into roots when planted under the soil! Better soil, better roots, better plants, better tomatoes! 13) Mix up some sea/fish emulsion in warm water and fertilize those plants immediately. We also use Miracle Grow’s “Quick Start” to help the roots get a head start in growth. We use it only at planting time. 14) Stake and cage the tomatoes correctly! 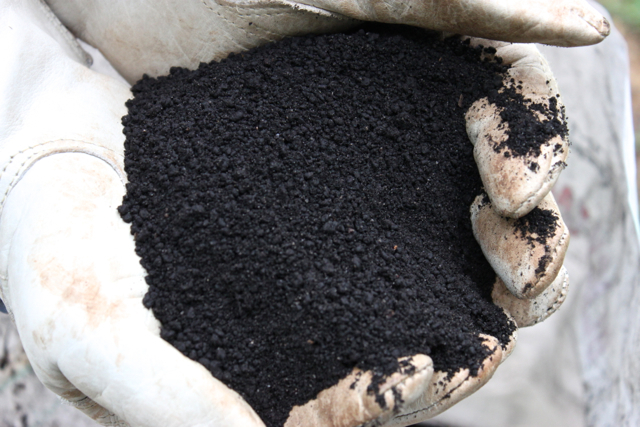 14) Continue to feed your organic fertilizer every 2 weeks or so. 15) I don’t know if “Osmocote” is organic or not, but this is what we sprinkle around all of our plants . . . this helps the production of large quantities of tomatoes. One fertilizer helps the plant grow and leaf out, this fertilizer helps increase the production of ‘fruit’ (which is really what tomatoes are). 16) Water in the morning and ALWAYS water underneath the tomato plants. Do not use a sprinkler and water from above. Do not get your tomato plant leaves wet; it promotes disease! Depending upon the weather, it is a good idea to water every other morning. Here in South Carolina, when the temperatures hit 90 – 100, we water every morning. 17) Continue to pinch / clip off any stems that may begin to touch the soil. NEVER let either leaf, branch or tomato touch the soil . . . this is one of the ways that disease enters the plants. Keep it clean underneath at all times. 18) Remove weeds on a daily basis, don’t let them get out of control. If you see a weed, get it out of the garden right then and there. And that’s it! It’s a lot of work and a labor of love, but you won’t believe the flavor, the quality and the bounty of tomatoes that you will have as a result of all of your dedication! 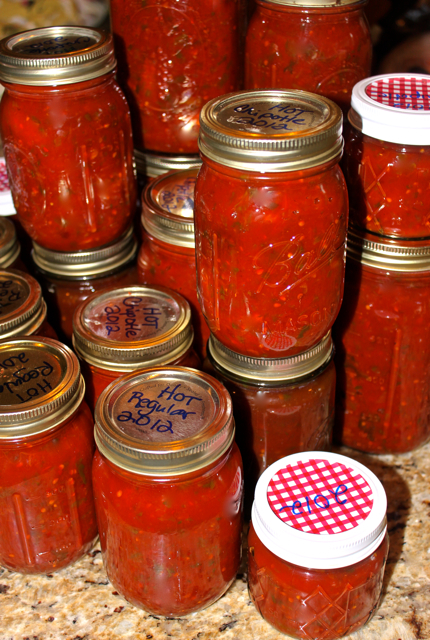 Later this summer I’ll tell you how to preserve all of your tomato bounty to enjoy throughout the cold months of winter! Thank you so much for stopping by my blog today! If you’ve enjoyed these gardening tips please consider leaving a comment and subscribing to my blog to receive e-mail notices of any new posts and recipes! Don’t worry about gardening Gabriela. . . keep up the great decorating, designing, and cooking! I know that’s what you excel in! I’ll try to do my best for you Rebeccah; thanks for your nice comment and for your visit! Thanks for taking the time to write this up Roz. Good information. We have clay soil here in Colorado and I’m surprised I can grow anything. I’ve had years of successful tomato plants and then suddenly had two bad years. I was about to give up, but will try some of the things you suggest that I’ve not been doing. Do you think planting tomatoes in the same area for so many years can cause things to go bad? Oh yes, thank you for reminding me . . . I do rotate plants around, especially the hungry feeders like tomatoes. I have to put that back in my post, cuz I just simply forgot! Don’t you just hate clay soil? It takes so much to amend it and time too! But we love our fresh veggies, so we keep at it! A wealth of very helpful information. You just can’t wish for beautiful tomatoes, can you? Anything worthwhile takes a bit of extra effort! So true Rosemary . . . in just about everything in life, huh? I was thinking about your comment this morning on my drive to work and thought about your words! So very true indeed! I wish I understood more about gardening…..thanks, Roz, for sharing the tips and tricks. Just let me know anything that you have questions about Angie; I’d be happy to help out! My husband deserves extra hugs, because he is the gardener. I enjoy reaping the rewards, but can’t get excited about digging in soil. (Hangs head in shame). I can, however, enjoy the fruits of his labor, because there is absolutely NOTHING like homegrown tomatoes. We’ve taken a few classes on gardening tomatoes, and have been happy that our results are better. LOVE the egg shell tip. I’ve read that one, but we aren’t doing it. We have to grow our tomatoes in containers, though. One year, we planted 24 tomatoes plants. One, by one, the moles would grab one and take it deep down into the earth to devour them. It was so frustrating. With the containers, on our sunny patio, we win the war! I do miss the free horse poo, I used to muck all the time. Lucky you! The only thing that I can recommend about the mole/vole problem is to get some great “mouser” cats. They hear and sniff out those critters better than anything I’ve ever tried. Moles/voles are the worst things on the planet when it comes to gardening! Love that fried chicken you made this week! Wow, those are all great tips and I do follow many of them, including the horse poo and the egg shells. I have a compost pit, but a lot of times, I just dig a hole and bury the garbage right in the vegetable garden. 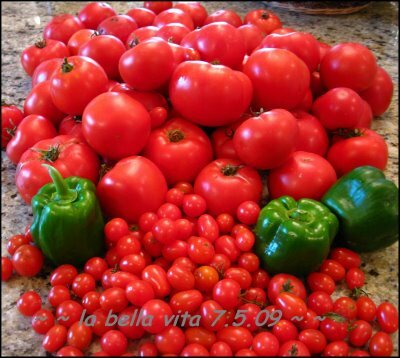 You must have fantabulous tomatoes if you follow all of your recommendations – and from the photos it appears you do. I’m sure that you have superb tomatoes too Linda! We do pamper our veggie garden! I can’t wait to read about your artichoke salad! Be right over! Mmm, very generous of you to share the secrets to those gorgeous tomatoes. Homegrown veggies are the best! (My sister is a gardener.) Your family is very lucky, Roz. Thanks Kim! Your family is fortunate to have you too with all of those yummies that you prepare! I’m not sure whether my mother will plant tomatoes this year since it was really my dad’s “thing” and it’s hard to say what will upset her and what will make her happy in his remembrance. I think she WILL eventually feel like growing them again is a tribute to him so I will save these tips for her when she does! I understand what you’re saying about your mother’s feelings. My mom told me that she is still not able to do anything other than clean the house and pay bills. I hope that both of our mothers will heal in time. Lots of great tips here Roz and I’m saving this. You are so right about rotating where you grow tomatoes. We do that now and it makes a big difference. We live in Indian country and follow their wisdom of not planting until after the last frost – which is, according to them for our area, May 15. Sometimes we cheat a little and plant a few basil plants that can easily be replaced if we get a late frost, but never tomatoes. It’s like you said – best to be patient and wait. Thanks Sam! And I’m not a patient person regarding most things in life. Hope you’re doing well these days! I need to stop by and see what you’ve cooked up today! I’ll be so happy to send you some Jessica when the big harvest comes in around mid to late July! What a story Val! I would give up too and simply go to the Farmer’s Markets as you do! Making my risotto today for the dinner club! 3 final exams finished with one more to go tomorrow. So along with grading the finished exams, I’ll be in my cucina! Thanks Anne! I just love this time of year when it’s not so freezing nor so scorching hot! I’m really at my utmost happy in the garden! Anytime that you need any advice on gardening, just let me know Nancy and I’ll exchange my brain bits for all of your knowledge on photography! So jealous of your talent! I am exhausted just reading about all the work you put into your soil. Just joking. This is a good reminder as I get my garden ready for planting. It’s a dog-gone good work out Sarah, after all of the good eating that we enjoy! Productive work out too! You are completely right about Italians and their gardens. 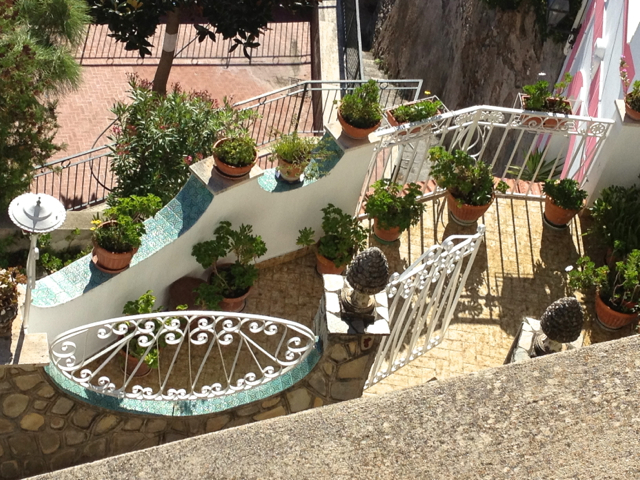 I live in southern Italy right now and every house on the street has a garden of some kind. And the fruit and vegetables that come out of them-Mama Mia! You are one lucky lady Amy. I dream of living in Italy at least for a month or two of the year! Enjoy la bella e dolce vita bella a mica! Grazie mille for your visit today! I will stop by and follow you in return! You speak the absolute truth Ilaria! And the tomatoes in Italy outshine those anywhere on the planet! 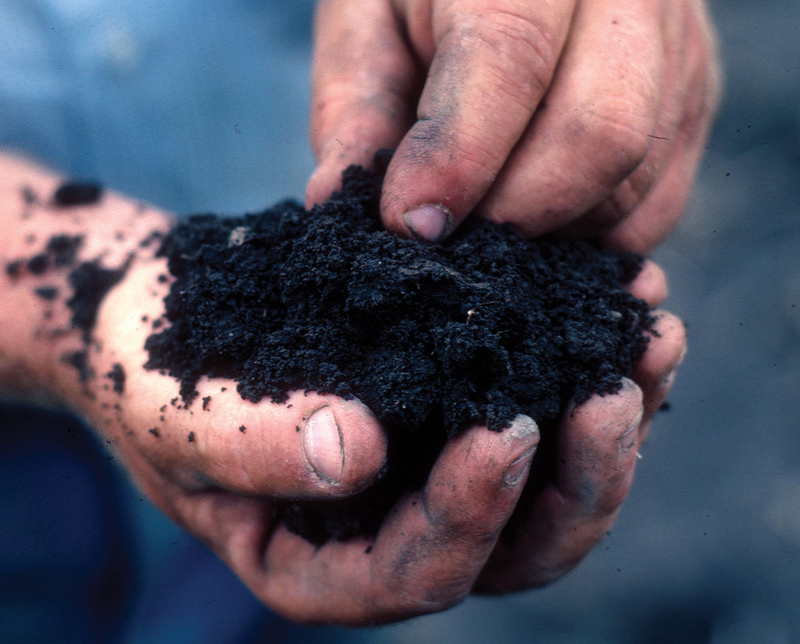 You have the perfect volcanic soil full of nutrients that vegetables love. I will never, ever forget the flavor of the vegetables in Italy! Thank you for your kind comment and I’m coming right over to your blog to see what you’ve been cooking! Thank you so much for this useful information. I only started planting my tomato last year. And I planted the seeds 2 weeks ago and the sprouts just popped up a few days ago (so exciting!). I’m going to follow your tips in keeping my plants healthy and fertilized. 🙂 Can’t wait to taste those red, ripe and juicy homegrown tomatoes again this summer! Oh how exciting for you Amy! I remember when I grew my first tomatoes back in 1979 and was just as excited as delivering an actual human baby! It is a learning process, so please be patient and kind on yourself as you learn! If you have any questions, please let me know. I will be so happy to help you! Thanks so much for sharing these great gardening tips, Roz! They will come in handy for me in Georgia! I know exactly what you mean about Italians and their gardens. My dad is 82, and still primps out in his every day! I would love to have someone primp out in my garden with me. My parents skipped their generation in gardening and farming since they were so burnt out from it from their childhoods, but I’m so glad that I picked gardening back up again! Roz, I’ve rarely seen so many beautiful tomatoes as you have in that photo. Your method of growing tomatoes sounds wonderful. I just wish I had the space. I might try growing a plant or two in containers on the patio. I usually get some pretty good tomatoes at the local farmer’s market here in Raleigh, NC. Our oldest son lives in Raleigh-Durham and I know that you have superb gardening outlets and farmers’ markets to enjoy. In fact, I think what you have in NC is far better than our selection here! Thanks for the kind comment! Pat recently posted gaddingaboutwith grandpat.blogspot.com about one of her favorite sandwiches. My comments about your post on growing tomatoes is above. Got it Pam; I’m going to hop on over to your blog right now to follow along! Thanks for the tips, Roz! I love growing tomatoes and can’t wait for that first warm, ripe tomato. I’ve never tried egg shells, worm castings, or bone meal. This year I will! I hope they help your tomatoes too Susan! Have a lovely day and thanks for stopping by with your sweet comment! We have just moved to Greer SC from Davenport IA. I will soon be preparing this awful red clay for spring planting, thanks for the tips. I am from Ames, Iowa! Have patience, and amend, amend, amend. You’ll begin to see that more corn is being grown now in SC and in large fields . . . that says something! My tomatoes and garden veggies are just as good as what I grew in Iowa, but it takes a LOT of soil prepping. And I am at an age that I don’t feel like planting peach trees and wait forever for the fruit reaped from all of the work. Email me if you have ANY questions about gardening in SC after living with the beautiful, rich, black soil of Iowa…..just go to the ‘contact’ link above. PS: WELCOME TO South Carolina, may your days here be as joyful as ours have been in the last 18 years of living here! Thank you so much- this is fabulous information . I can’t wait to get out there and try some of the tips. Hello Roz. I read your article. it’s too amazing and helpful. I totally agree with your point. With the help of these steps we can get the huge flavorfull tomatoes and also get the bumper crop tomatoes. I also grow tomatoes in my lawn. All the tomatoes are well growing without any fungus. Thank you Anders! I’m glad that you found these tips helpful. I can say that we have a huge bumper crop of tomatoes every year following these methods! And another thing those egg shells are good for…at least here on the WestCoast of Canada…is to scatter crushed shells around your plants…slugs and snails hate to crawl over them…do the same thing with spent coffee grounds…they don’t like that either. You can also use a product that is crushed oyster shells for the calcium! My Mother was a fabulous gardener and grew all her tomatoes from saved seeds every year…her plants were amazing and she taught me how to deal with them. Can hardly wait for the day to pick a warm, juicy tomato from the garden. If you haven’t tried this variety of cherry tomato…please, let me tell you, they are heaven…SunGold…desert island tomatoes! 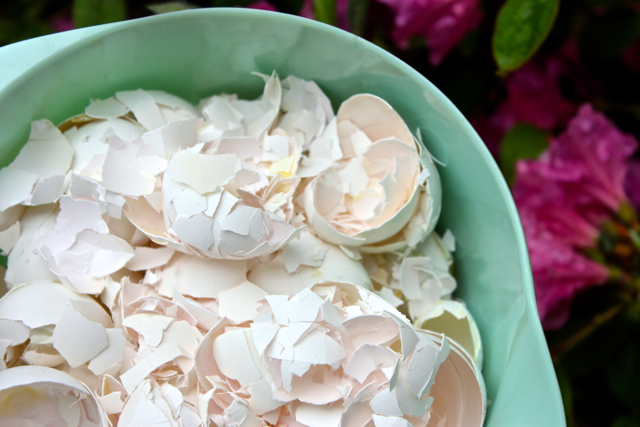 We save all of our egg shells, Phyllis, and you’ve given me even more great ideas on how to use them in the garden! A wonderful tutorial on growing tomatoes, Roz. I don’t have a spot for a garden at our new home but thankfully there are organic farmers who come to the two farmer’s markets in our area with wonderful tomatoes. We just sliced up a Cherokee Purple to put on our lunch sandwiches…just delicious. These are great tips! This season I purchased red wigglers and have a worm compost going, its like black gold. I like the idea of bone meal. I need to put that on my list. Can you tell me the amount of Osmocote you use on the tomato plants?